Remove and prevent mildew growth from overtaking your vessel! Your boat is under attack, and it's not by pirates or an errant torpedo. Mildew and mold thrive in the nautical environment. The Marine 31 Mildew Remover Combo is designed to eradicate this pesky invader so you can focus on what's important � the sea, the waves, the scents, the breeze and the good times. 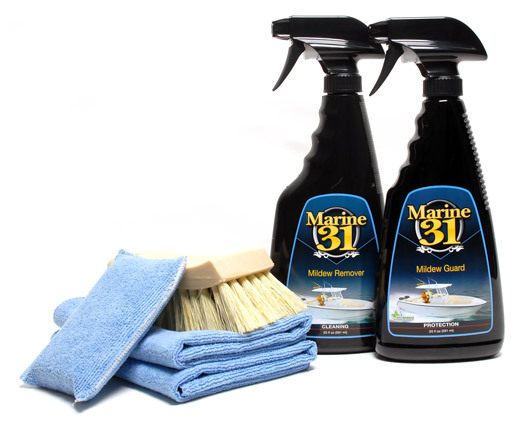 The Marine 31 Mildew Remover Combo even comes with the necessary brush, applicator and towels so you don't have to worry; just let your concerns float down stream. The Natural Tampico Upholstery & Carpet Scrub Brush is made of tampico bristles, which are highly resistant to chemicals and have a perfect texture for scrubbing carpet and upholstery. Tampico fibers make an excellent scrub brush because they are naturally resistant to heat, chemicals, and liquids. The Natural Tampico Upholstery & Carpet Brush has an ergonomic design that is comfortable to use. Use the microfiber applicator pad to apply Mildew Guard. This soft microfiber fabric is made of a split weave that is more absorbent than any flat weave microfiber. The inner foam pad maximizes absorption so any product you�re applying goes on streak-free. A World From The Captain's Chair: Don't let yer eyes witness the horror of a mold-infested boat. If I have seen it too many times in my years on the seas. The Marine 31 Mildew Remover Combo will gives you everything you need to keep your boat looking its best. Life is too short to spend it covered in mold. Purchased this combo to clean the awning on a very dirty RV. Smells like it's just a diluted bleach but works extremely well. I sprayed on used a brush to work in and let sit. After that, I just washed off with a garden hose and applied the protectant with the supplied applicator. Recommend for marine or RV applications.